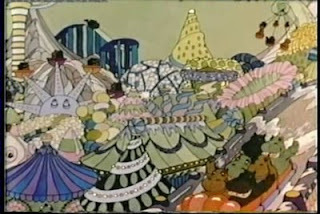 I’ve often wondered why “The Yellow Submarine” (1968) didn’t inspire more films, especially considering how refreshingly imaginative and surprisingly popular it was. 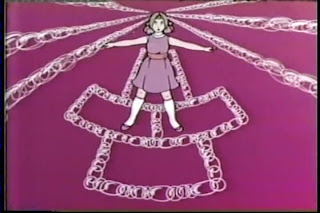 One of the few places where it seems to have spawned any progeny is in Hungary, where the works of Marcell Jankovics further explored the surreal, psychedelic possibilities of animation. 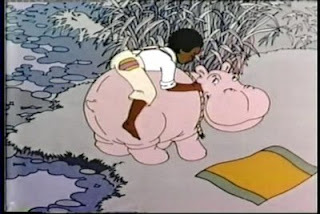 Hungary is also the birthplace of a bizarre children’s movie named “Hugo the Hippo” (1973), which has been all but forgotten by popular culture. Admittedly, they never embraced it in the first place; it’s short-lived English-dubbed US trial release failed to generate profit. Languishing as a marginalized cult curio financially unworthy of DVD distribution, “Hugo the Hippo” now lurks in the recesses of the bootleg community. 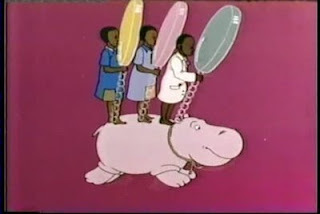 “Hugo the Hippo” has a quintessentially 1970’s vibe with its “Schoolhouse Rock”-esque animation, its anti-authoritarian attitude and its soundtrack sung by the two youngest Osmonds. It’s full of charm and whimsy along with some positive underlying messages, but it’s far more troublesome than most kid’s movies in its depiction of race, class and violence, not to mention parental and political authority. Though it’s decried as too edgy for children and too tame for adults, I only likely it all the more for refusing to stay put, even on a safe middle ground. 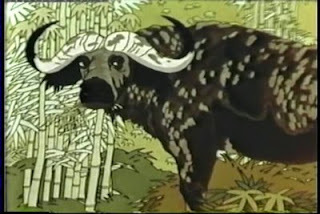 From the opening of “Hugo the Hippo,” you might be tempted to think you were watching some type of edutainment special, complete with geographical information on Zanzibar, its sultan and the chief industry: cloves. (A later segment provides some important statistics concerning Mt. Kilimanjaro.) 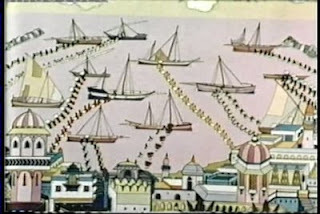 The information sets up a city in crisis, Dar es Salaam, whose shallow harbor is under siege by sharks, halting the lucrative spice commerce. 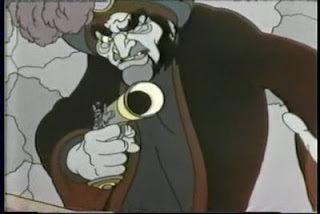 Against the counsel of his sinister Financial Minister Aban-Khan (voiced by Robert Morley) and his European adviser, the sultan decides that the only solution is to employ a dozen hippopotami to clean up the cove. If only politicians today could problem-solve like that! 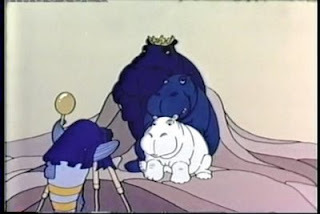 Hugo, the carefree prince of the Hippo kingdom, witnesses the kidnapping of his family and tribe by Aban-Khan and the sultan’s ludicrous court magician, whose every action is accompanied by random radio sound effects. 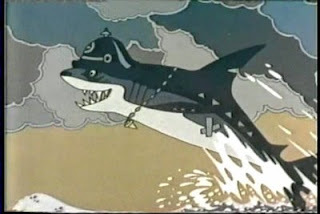 Stowing away on the trip back to Dar es Salaam and defeating the sharks (who wear various iconic hats and smoke cigars underwater) is only the very beginning of Hugo’s adventures. The film’s second half sees Hugo adopted by the young Jorma in a nearby village and beleaguered by self-serving adults until a courtroom drama showdown with Aban-Kan. 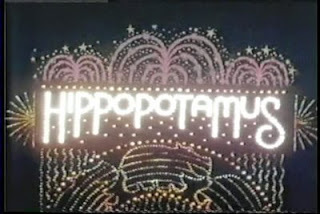 The first twenty minutes or so of the film run the slowest, largely because the hippos have not yet been introduced. 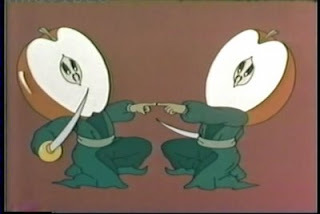 Once they arrive on screen, announced with the first memorable musical number, the film really sustains itself as both a musical and an adventure. Unlike traditional animal animations Hugo never speaks, instead preferring to frolic and swim. He rarely even displays any emotional expression beyond pleasure and fear. This has the central advantage that Hugo is almost always either smiling or eating, both states that could be described as adorable. Aside from the narration, most of the story is told from the point of view of Jorma, a young African boy who prefers fishing and gardening to schoolwork. Even Jorma is not particularly talkative; the film’s action is usually presented through non-diegetic songs instead. While I’m not a fan of the Osmonds in general, the music in “Hugo” is surprisingly catchy and kitschy. It’s often marked by a rough naivety, with little regard for syllable counts, consistent rhyme schemes or minimum lengths. Which introduces us to Hugo and his family in their underwater amusement-park paradise and features descriptions like “He walks like an elephant / He swims like a whale / His head’s like a pail; it’s pathetic / Oh plainly, his tail’s unaesthetic / Though nature endowed him poorly, / I still love the hippo dearly” (those last two lines presumably rhyming…). 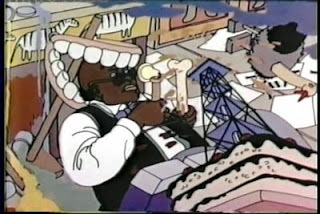 One of the stranger songs, chronicling the systematic absentmindedness of local teacher Mr. M’Bow-Wow who “Looks at the world through a telescope turned the wrong way / Listens to words, but he never does hear what you actually say.” Features Mr. M’Bow-Wow riding on an ostrich and electrocuting himself by sticking a fork in a toaster. 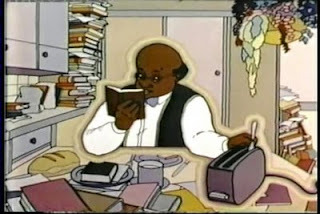 Conversely, much of the dialogue belongs to the villains, who tend to be authority figures like the cruel Financial Minister Aban-Khan, the inattentive backwards teacher Mr. M’Bow-Wow and Jorma’s totalitarian parents. Unusual is just how nefarious and unsympathetic these characters are: Aban-Khan ruthlessly slaughters all the Hippos except Hugo, Mr. M’Bow-Wow finks on his pupils by claiming that Hugo is – gasp! – interfering with their education while the parents, perhaps most senselessly of all, burn down a magnificent hippo-Eden garden cultivated by the industrious children. Nor is there any doubt of what’s going on when flames overtake the screen during the garden razing or afterwards, when the hypocritical townspeople call for the death penalty because the hungry Hugo now pillages their crops. The scenes where you’re not quite sure what’s going on are arguably even creepier. 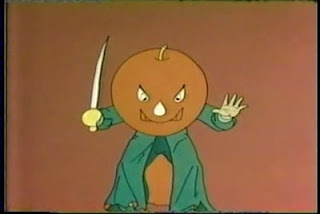 An especially notable example is brought on by the magician, whose demeanor is like a wacky clown, but whose creations are menacing abominations. 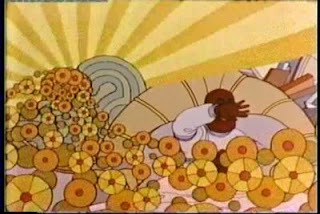 He booby-traps Hugo with succulent-smelling magical garden that transports him and Jorma through a nightmare gauntlet. Giant corncob artilleries chase the pair towards pea pod machine guns while other vitamin-rich monsters like an apple samurai and a banana octopus go in for the kill. 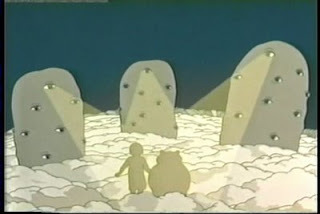 Eventually tricked onto a planet made of cauliflower, Hugo and Jorma are cornered by squash UFOs and hypnotized by many-eyed potato totems. 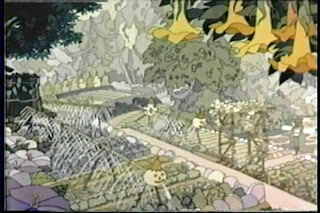 The magician’s (adult world) garden with its technological and war-mongering aberrations contrasts sharply with the children’s peaceful vegetable patch. 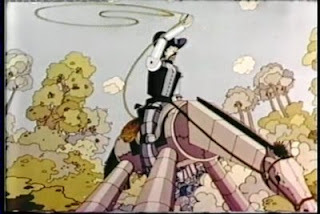 Earlier the magician had summoned a robot horse that slurps up all the water in Hugo’s home, while it’s gun-toting cyborg-cowboy rider lassos Hippos with mechanical efficiency. Whether these creations are a commentary on the dangerous encroachment of Western civilization, modern industrialization or just callous adulthood is a bit hazy under all the weirdness. I think it’s probably a combination of all three, plus little too much weed (in this case, as in Yellow Submarine, the drug habits of the creators are well documented). Woven elsewhere in the film are other digs at modern society and “civilized” behavior in general, especially the failure of humanity to coexist equitably with the environment, animals and each other. Though this sounds potentially heavy and didactic, “Hugo the Hippo” is largely a psychedelic playhouse that has too much fun to preach excessively. It’s moments of terror are quickly overtaken by song and its lesson-teaching tragedies are defeated by simple youthful optimism and good governance. 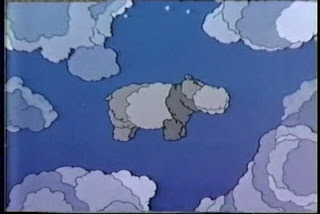 Perhaps the genius of “Hugo the Hippo” is that, despite violating any number of rules about how to make an acceptable movie for kids, its surreal delivery is perfectly caters to them. 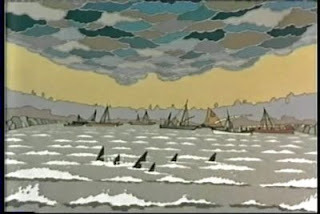 Most young viewers will have little trouble deciphering the plot or understanding, intuitively, the themes. Parents expecting straightforward formulas, not to mention film critics, just won’t “get it.” Like Apple Jacks. Films like “Hugo” take questionable risks to offer up different ideas, new images and fresh feelings and require our imagination to meet them halfway. With “Hugo the Hippo,” it could be very easy to reject the unpolished narrative and unhip songs and miss out on a novel experience that few films, least of all family films, offer. For ultimately this film is less about celebrating the 1970’s (that’s just when most nostalgic fans first saw it) than harkening back to an age when we knew our homegrown illogical fantasy worlds were better than the sane, mature, normal realities where grown-ups live. Apologies for this non-sequitur of a comment. Antagony & Ecstasy recently tagged me in the ‘ten favourite movie characters’ meme. (Rules and my choices here: http://misterneil.blogspot.com/2009/03/ten-favourite-movie-characters.html). Call me superstitious, but when I’m told to tag another five film blogs … well, hence this comment. Apologies if you’ve already been tagged or are just too busy for this kind of thing. If you’re not, it’ll be interesting to see your choices. The film walrus welcomes non-sequiturs with open arms. It also welcomes the honor of being tagged for this meme! It sounds like a lot of fun and I'll definitely put something together. Is it too last-thing-on-my-mind to consider Hugo? Well, all bets are off since you already stole Kilgore (great 10, by the way). I remember seeing this movie at the theatre as a child and I loved it. 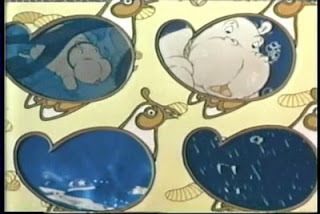 I am 42 years old and still remember "Where ever you go, Hugo, we go, too!" :) Admittedly, that's all I remember, really ... but I do know that I loved the film.